This rice side dish is one that has just a few added ingredients to elevate the grain to another level. Rice by itself is pretty tasty, but if you add some nuts and dried fruit, your mouth will be hit with different textures and flavors that make it so much more delectable. 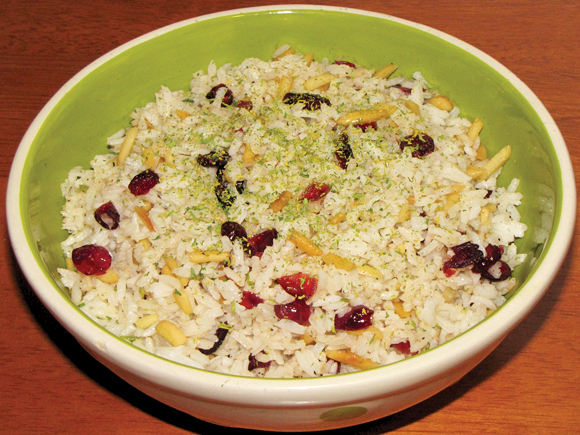 The rice in this dish can easily change to brown rice instead of white or you can even use different dried fruit. I've used raisins before, and the end result is just as good, but I like the tang that cranberries offer. The possibilities are endless and the only way to find your favorite nut/fruit combination is to experiment. I have a few more versions based on this recipe so keep an eye out! 1. Melt 1 TB butter in saucepan over medium heat. 2. Add rice and stir to coat with butter. 3. Add water (be careful not to get burned by water splatter), stir and bring to boil. 4. Reduce heat to low, cover, and cook for 15 minutes. 5. After 15 minutes, turn off heat. Leave the rice on the burner and don't take the lid off for 5-10 minutes. 1. Melt 2 TB butter in large skillet. 2. Add almonds and cook over medium heat for about two minutes, stirring frequently. 3. Add cranberries and continue to cook until almonds are a light brown color. 4. Stir in rice and season with salt and pepper.